But he probably still isn’t going to win all four majors. Jordan Spieth holds up the trophy after winning the U.S. Open golf tournament in June. Right after Jordan Spieth won the U.S. Open — his second consecutive major championship to start the 2015 season — we examined the probability of his finishing off golf’s Grand Slam with victories in the British Open and PGA Championship as well. According to the betting markets1 at the time, Spieth had roughly a 9 percent chance of winning each remaining leg of the Slam and only a 0.9 percent probability of capturing both.2 And that 9 percent wasn’t even tops in the field: The markets favored world No. 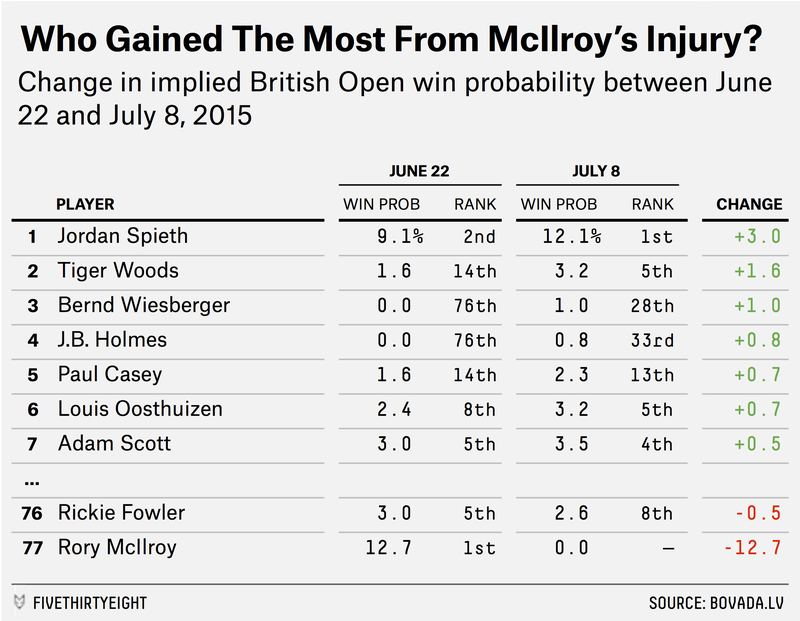 1 Rory McIlroy over Spieth in each tournament. But on Wednesday, McIlroy announced that he would not play in the British Open after he injured his ankle while playing soccer over the weekend. With the tournament’s favorite and defending champion out of the picture, Spieth’s odds of pulling off the Grand Slam increased by 33 percent. But that’s not really saying much. According to the market, his chances are still quite remote — 1.1 percent, to be (overly) precise. With McIlroy out of the picture, Spieth is now the favorite to capture the British Open’s prestigious Claret Jug. His 12.1 percent win probability is 7 percentage points higher than that of the next-closest player, Dustin Johnson. Spieth beat Johnson3 by a stroke at the U.S. Open after Johnson missed a short putt. Of course, other sportsbooks have offered a separate bet on whether Spieth can complete the Slam, and they give him more favorable odds of a +2500 money line. That equates to a 3.8 percent probability of success — though that also doesn’t account for the bookmaker’s cut on the bet, meaning that the true probability is lower (if not quite as low as 1 percent). But even a 3 percent Grand Slam probability implies a 17 percent probability of winning each of the season’s final two majors, which is very high. As a point of comparison, Jack Nicklaus (arguably the greatest golfer ever) had an 18 percent win rate during his prime. The most majors that Nicklaus won in a calendar year: two. Specifically, the futures odds provided by the sportsbook Bovada. Assuming each tournament is an independent event.